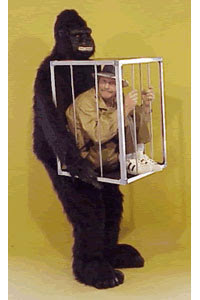 ...or bigfoot can put you in jail. On April 01, in 1969 Skamania County, Washington was the first official U.S. governmental body to legally recognize Bigfoot as a species. By passing of Ordinance 69-01, Skamania County declared the killing of bigfoot illegal; punishable by a $10,000 fine and 5 years in prison. 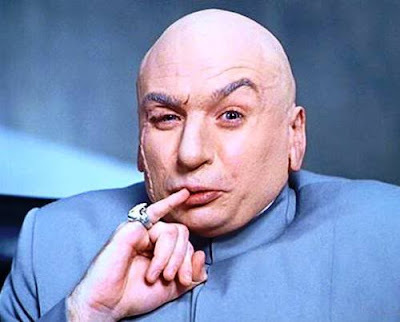 Although originally an April Fool's joke, it sat in the books for over a dozen years before becoming an official statute with legally binding consequences. In 1984 the ordinance was repealled and amended as ordinance 1984-2. The new ordinance reduced the fine and jail time to “gross misdemeanor” status. Don't be fooled by the lighter misdeameanor status, due to an exception written into the ordinance, if the animal (Bigfoot) is found to be humanoid, the person who killed the Bigfoot will be tried for homicide. 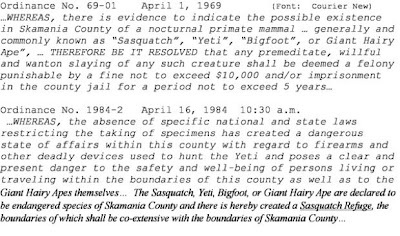 Even more interesting, the more recent ordinance sets up all of Skamania as a “Sasquatch Refuge.” The reason – Bigfoot is an “endangered species” in Skamania County. Skamania does not claim Bigfoot is endangered overall, just within its own county lines. Thomas H. Maugh II of the Los Angeles Times reports DNA evidence extracted from pinky finger indicates that at least four species of human-like creatures walked the Earth at the same time. More hominids strengthens the argument for the likeliness of a yet undiscovered primate lurking the hidden landscapes of the world. An exerpt from the article is below. LOS ANGELES -- DNA from a 40,000-year-old pinkie finger, belonging to a child and found in a cave in Siberia, indicates that the bone is from a previously unknown family of human relatives that lived among Neanderthals and modern humans, German researchers reported Wednesday. The discovery, if confirmed by research already under way, would mark the first time that an entirely new species of hominid has been identified solely on the basis of DNA sequencing, the team reported online in the journal Nature. It also suggests that other currently unknown species could be similarly identified. With the recent, and still controversial, discovery of the Hobbitt-like species Homo floriensis that survived in Indonesia until about 13,000 years ago, the evidence now indicates that at least four species of human-like creatures walked the Earth at the same time. The find suggests that "40,000 years ago, the planet was more crowded than we thought," wrote evolutionary biologist Terence A. Brown of the University of Manchester in an editorial accompanying the report. Time Magazine Takes on Bigfoot--Kind of. Techland is a time.com technology site in partnership with CNN, which is owned by Time/Warner, formerly AOL Time Warner, and formerly two separate corporations until Warner Communications, Inc. and Time Inc., (along with the assets of a third company, Turner Broadcasting System, Inc.) formed the current Time Warner. All this corporate back-story is important, otherwise they wouldn't have turned a regular logo (as seen above) into a black book branded with every media corporation it slept with. What about Bigfoot? Okay let's get to it. Doug Aamoth is Techland's gadget reviewer, and blogs about gadgets. Today he picked Bigfoot. Ah ah ah, we know Bigfoot is not a gadget, but that does not stop Doug from reviewing him. The story is nothing new; it has a link to BFRO.Net, ponders the paranormal aspects of bigfoot by quoting Dolores Cannon's book, The Convoluted Universe, Volume 1. He quotes Dolores Cannon a second time and concludes Bigfoot's elusiveness may be due to ESP. you can read all this good stuff at the links provided below. Mike, is not so different from other Bigfoot Lunch Club admirers; he emailed us, fanned us, and basically stalked us. We thought turnabout was fair play, so we decided the next time he appeared on our front lawn we would tie him down and interrogate--er interview him. The truth is we love this tshirt so much we wanted to find out more about this design and the man behind it. Without further Ado here is the exclusive BLC Interview with Mike Weihs and his thoughts about Bigfoot and his tshirt design. 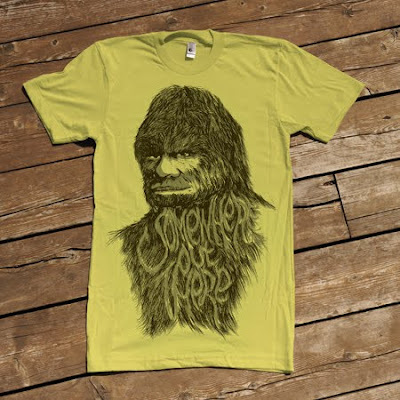 BLC: Hands down this is one of the best bigfoot tshirts out there and we've seen them all (see link at the end of post) The difference with yours, is that its a little more sympathetic towards the search for Sasquatch, was that intentional? MW: Definitely. The online community seems to take this very seriously, which is great but I think people who have have never looked into the subject often see that intensity as off putting. I wanted to have a shirt that was more relaxed and put things on a more wishful & fun level. Your suggestion that it seems sympathetic feels right to me because I was trying to make something that people would like to wear that in a way could support the cause while at the same time projecting a sense of hope for the unknown in general. BLC: What was your reference point for the illustration of this Bigfoot? MW: The P&G film was my main influence for the face and head. Like a lot of us those images have been burned in my mind from so many viewings of the film growing up. Since those images have such a pop culture presence and I was hoping to get both Sasquatch enthusiasts & the non-interested I wanted to draw from that while giving it a more personal look and expression. Hopefully those who don’t believe in the film’s authenticity will look past the anatomy and look more towards the message it’s trying to say. BLC: What about Bigfoot interests you? MW: Since I was in elementary school I’ve always been very interested in Sasquatch. Over the years my interest has come and gone but I’d say for about 5 years I’ve been more active in finding information. Obviously the rise of Bigfoot related websites have made finding this more accessible. Plus they really made me aware of the community that’s out there. I moved to Portland, Oregon from the midwest a couple years ago and am hoping to make some camping expeditions this summer. Not going to bring thermal cameras or any high tec gear, just a desire for the unknown. I feel like Dr. Jane Goodall quote on NPR a few years ago “...maybe they don't exist, but I want them to.“ is good representation of how I feel now. MW: Tease is a section of the blog run by the studio department of Wieden + Kennedy, an advertising agency in Portland, OR. We like to design posters and t-shirts and other merch in order for us have a chance to design for ourselves outside of the client work we do all day, everyday. It’s a small operation that we got off the ground last year. There are lots of other great designs and we currently have some hand screen printed posters where all the profit goes to supporting the Hati relief effort. During the day I do a lot of graphic design for for Old Spice and EA games. BLC: You said you wanted the design to reflect how you felt personally, can you expand? MW: I think some of my statements above help explain this. 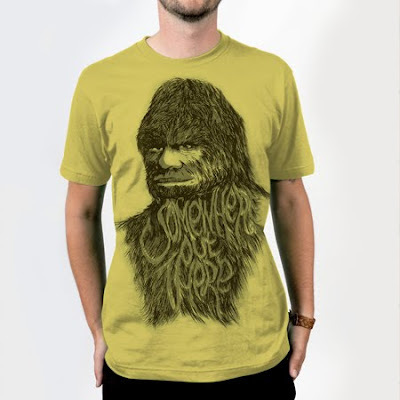 No offense to the other Sasquatch related shirts out there but I wasn’t really finding something that had the design sense I personally look for in a shirt. Something that could have a message but mainly just be a design that people would feel good about wearing. Also with having the message “Somewhere out there” in the fur I wanted to subtly be able to portray that romanticism/hope I feel about Sasquatch being out there. That feeling that as humans we don’t know everything about our planet. BLC: Tell us what you like about Bigfoot Lunch Club! and have you learned the not-so-secret handshake? MW: I like BFLC because it’s not just about the research and sighting. It’s got a great feel for bigfoot in our culture. Plus the facebook group is great because to me it’s a easy place to get into the community while not being as imposing as some of the forums out there (which are great as well but in a different way). The secret handshake is AWESOME! I love it but unfoturnatly haven’t had a chance to do it with anyone yet. I’m hoping to go the symposium this June in Eugene and get a chance there. Thanks Mike! Now below is what those advertising-types call the soft sell and call to action. 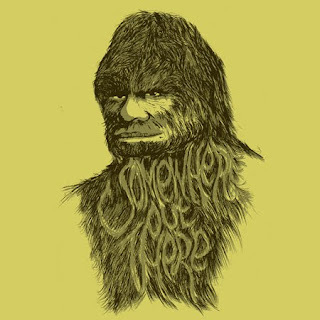 *clears throat* Buy this phenomenal t-shirt and own something created by a designer who truly cares about Bigfoot and Bigfooters, and who also happens to work for an award-winning design firm by clicking here. You are observing a genuine shirt that was discovered deep in the forests of the Pacific NW. It gives support to all those who hope our species has not yet discovered or answered all the mysteries our planet holds while at the same time making people look quite dapper. Never Heard of Wieden + Kennedy? The Carolina Newswire reports Composer/pianist/vocalist/author Marc Hoffman has been tapped to compose a soundtrack or music bed for the website bushloper.net. Marc Hoffman received his degree in composition from the North Carolina School of the Arts and studied film composition at the University of Southern California. Although some would argue you should never "force" a visitor to listen to a soundtrack on your site, visitors should have an option to mute the music. That said, this music bed composed by Marc Hoffman is perfect "background" music. Its tasteful and only loops once. The article continues to describe the music. Near the end of the piece, “Bigfoot” howls in the background. To create that effect, Hoffman had Greene's young grandson, Evan Racz, howl, then he manipulated the audio file to get the effect. 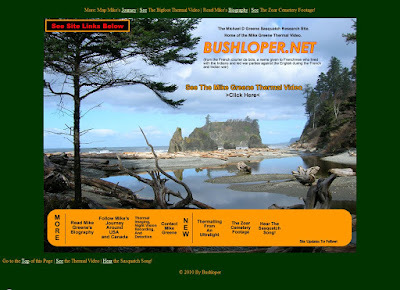 Visit the site below and listen to this poetic interpretation of Sasquatch and Bigfooting. It is awe inspiring and definitely make you want to get you Squatch-on! Yeah we just said that. Filling in for George Knapp on February 28th, Ian Punnett was joined on Coast to Coast AM, for the latter half of the program, by Bigfoot researcher David Paulides and forensic artist Harvey Pratt for a discussion on the relationship between Native American cultures and Bigfoot as well as their work using eyewitness testimony to craft forensic sketches of the creature. Paulides revealed that they have uncovered a number of tales of Bigfoot abducting humans. He shared one story, from around the 1940's or 50's, of a girl from the city who was visiting her family in a rural part of California. She went off into the woods to pick berries and disappeared. A month later, she reemerged and claimed she'd been "kidnapped by the hairy man." Pratt concurred with the pervasiveness of these types of stories, saying that he's heard similar tales "even closer to our time frame." Regarding their work turning sightings into sketches, Pratt stressed that he serves as a forensic artist as opposed to an illustrator and that all of his drawings are done with the witnesses present and are based solely on their testimony. "We go through a great deal of dialogue," Pratt said, with the goal of capturing the sighting from all angles, including the face as well as the back and shoulders. 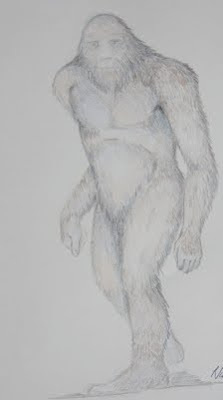 Despite the ongoing debate in the cryptozoology community over whether the creature is ape-like or human-like, Paulides marveled that "we have yet to draw anything close to an ape." 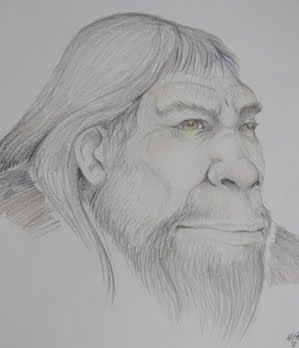 Another trend that they have noticed is that the hair color of the Bigfoot seems to coincide with its age, similar to how a human's hair changes over time. For instance, all of the reported golden-colored Bigfoot are smaller and underdeveloped while the grey haired ones are older and frail-looking creatures. 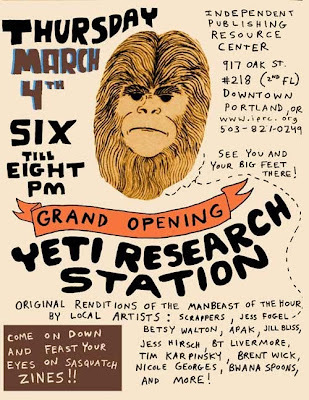 OK, we know Yeti's are located in east Asia, high in the Himalayas, so why are they opening a research station in Portland Oregon? Apparently to facilitate creative expression and identity by providing individual access to the resources and tools for the creation of independently published media and art. Yes, this is an endeavor by The Independent Publishing Resource Center (IPRC). The IPRC is one of the only nonprofit self-publishing centers of its kind anywhere in the world. We offer access to workspace and tools to aid in the production and distribution of zines, comics, hand-bound books and artwork. This includes computer workstations for writing, scanning, graphic design & desktop publishing, and high-speed internet access for research and networking purposes; two copiers, five table-top letterpresses, three Gocco printers, a YuDu screenprinter, and various other tools for creating, binding, and assembling publications. We also have two art galleries and one of the nation’s largest circulating zine libraries. Workspace and equipment is available to any member of the public at either an hourly ($5/hour) or yearly rate (begins at $45-100/year, sliding scale). 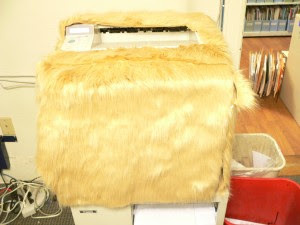 They have brought in a team of creative experts—including artists Scrappers, Lori D, Nicole Georges and many others—to help transform the computer lab into a Yeti Research Station.